A wide format printer is a machine that can print on larger paper than a conventional printer. These are devices are used to print banners, posters, wallpaper, murals, vehicle wraps, and any other large print job. Large format printers are usually designed for printing onto a roll of print media, rather than individual sheets during the printing process. Also known as large format printers or plotters, wide format devices are capable of printing on a larger scale than your standard business photocopier. HP wide format printers, some times referred to as an LFP, are mainly associated with graphics arts and design printing, producing high quality artwork, whereas plotters tend to be more often associated with CAD and GIS printing, specialist applications for architects, manufacturers and mappers, who require their printing to be more accurate in fine lines and details for plans and drawings. Most large format printers have the ability to print on A1 and A0 size paper width, as many devices are roll fed, the length of output can run into many metres. You also have the option to print onto different media types, including photo paper, canvas, vinyl, backlit film, technical papers and coated papers. This gives customers great value for money as the device brings huge flexibility and scope for producing many types of printed output. 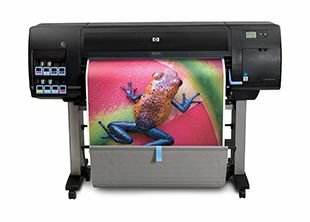 Who are Large Format Printers for? Large format printers are used by a range of industries, including: designers, professional print shops, university art departments, in-house marketing teams and vehicle wrapping companies. As technology advances and becomes easy to use and as well become more tech-savvy, more and more companies are moving away from outsourcing their large format printing, and bringing it in-house with their own large format printers. There are many benefits to bringing large format printing in-house, the main ones including cost and productivity. The mark-up on outsourced printing is huge, and can be more expensive that purchasing the device, paper and ink yourself. Additionally, the artwork can be printed instantly, making it a much more productive process than outsourcing. As a HP Gold Partner and DesignJet Production Specialist Centre, we all fully accredited to sell and service this range of printers. We have the in-house expertise to recommend a large format printer based on your requirements and usage. As well as this, our Midshire engineers are trained to support and maintain these printers for customers across the UK. Midshire offers a variety of purchasing options on our range of HP large format printers. You can either purchase the device outright, or put the equipment on a lease, spreading the cost of the purchase over 3 to 5 years. Midshire is also able to service HP large format printers on a brand new Ink Inclusive Contract. An Ink Inclusive Contract means you pay for all ink and service in one managed cost. The costing for this type of contract is determined as a price per millilitre of ink use. As a HP Gold Partner, Midshire has access to the full range of HP large format printers, which are able to feed A0 and A1 paper.